When a person dies, he is nothing but yellow dust; his lost soul is led on its journey back home with the help of a shaman’ The creation of this work was underwritten by a grant from the Jerome Foundation. 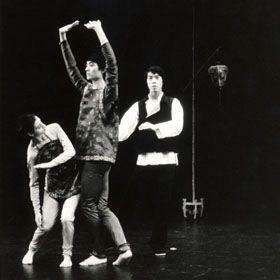 The dance is based on an abstract poem by Wai-Lim Yip which speaks of the ancient wars of China. Voice of the Yellow Dust has been described by the New York Times as being, ‘an eerie excursion into the world of Shamans, the dead and exorcism, ’ having all the magic of a fairy tale.’ In the legend, a person leads spirits of misfortunate deaths back to their homeland. Incorporating voice, poetry and theater, the dance expresses the Chinese sentiment of life and death through a combining of East and West, old and new.